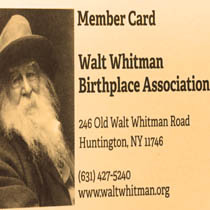 Free admission to Walt Whitman Birthplace and Interpretive Center for a unit of four people. Annual subscription to Starting from Paumanok, WWBA’s seasonal newsletter. Free admission/substantial discounts for all programs held. Invitations to special events. 10% discount on museum shop purchases. 10% discount for site rentals for personal poetry readings or social events. Your name printed in our newsletter, Starting from Paumanok. Placement of your book in the museum gift shop. Best of the Best American Poetry, 25th Anniversary Edition, by editor/poet David Lehman.